Jessica Mendoza admits she’s one of the boys. Not only is she one of the most popular basketball courtside reporters in the country (she’s been in front of the camera since her college days! 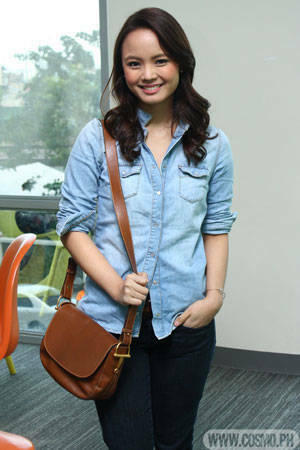 ), she’s now also FHM’s newest online columnist. And when she’s not hosting her daily radio program with Andi Manzano, she’s geek-ing it out watching Star Wars! Trust us boys, you do not want to challenge her to a trivia match if you hate losing! So when we asked if we could check out the contents of her leather shoulder bag, we were pleasantly surprised to find a lot of kikay essentials. She’s a girly girl at heart! Launch the gallery and check out Jessica's daily beauty must-haves!